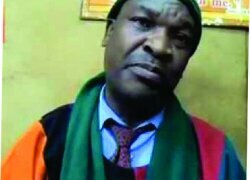 I challenge the Zambia Soccer Fans Association (ZSFA) patron Peter Makembo to speak the truth and name those that are causing division in Football Association of Zambia (FAZ), leading to the Chipolopolo under-performing, Damiano Academy proprietor Damiano Mutale has charged. Mutale in an interview yesterday said it was shocking that Makembo would state that there were divisions in FAZ when he was neither a councillor nor an official. The Mufulira-based football administrator was reacting to a story in the Daily Nation in which Makembo claimed that a division in FAZ was partly to blame for Zambia’s stuttering performance against Guinea Bissau in the AfCON qualifiers because some people wanted Andrew Kamanga to be portrayed as a failed administrator. “I am surprised that Makembo can say there were divisions in FAZ when he was an outsider. I believe Makembo knows something and should point at the people contributing to the non-performance of the national team because they are not happy with Kamanga. ‘‘Let him speak the truth and not beat about the bush; who are the people plotting the down fall of Kamanga?” he said. He said the ZSFA chairman should not issue statements without proof which made people lose confidence in the FAZ leadership. “It is such statements that initiate lack of confidence in the FAZ leadership. The association’s name is being ridiculed and I hope such kind of situation will not continue,” he said. Mutale also questioned the authority that Makembo had to tell Kamanga to fire coach George Lwandamina. “Makembo should allow Kamanga to make decisions. If Kamanga wants to overhaul the technical bench, he will do so unlike being told what to do. It is such pressures that have resulted into rushed decisions, “he said. Zambia was last Saturday ejected from the 2017 AfCON qualifiers after losing 3-2 to Guinea Bissau, with Makembo calling for the overhaul of the national team technical bench.